I'd write a thank you to Mark Bittman at the New York Times, but he's probably busy coming up with 18 ways to use parsley for next week's article (as a base for a garlic herb paste for pork roast, Mark?). Anyways, his recent ode to zucchini struck home. It's super cheap and plentiful. Plus, cooked the Bittman way in this pasta, it's packed with flavor, primarily thanks to my Italian shopkeeper friend who made the sausage. Lucky for me I had half a link in the freezer. Crummy Labor Day weather sapped the desire to grill from me. And it's a good thing too, since I had nothing good to grill. So I skipped the store and worked from freezer and pantry for a pasta that was nearly as good for a next day lunch as for dinner. PLUS, I had the satisfaction of using some ham that I'd frozen after some sandwich making family event (wrapped in plastic and stored in a zip top baggie). Salt and start pasta water and cook pasta according to directions. Save 1/2 cup pasta water before draining. In large skillet heat 2 tablespoons of olive oil over medium flame. Add onions and cook until mostly softened. Add garlic and cook 1-2 minutes. Toss in ham. Cook through. Glug in red wine and let mostly evaporate. Stir in tomatoes. Bubble away for 10 minutes. Stir in frozen peas, cooking until tender. 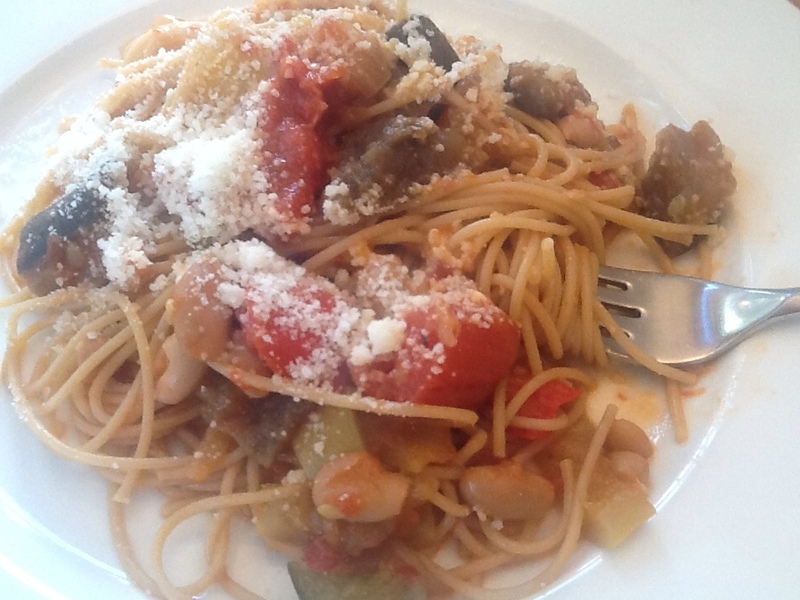 Toss in pasta, thin sauce with pasta water, and top dress with grated cheese. Seriously worth cheating on meat free Monday! I kind of daydream about this pasta. Ok I do daydream. And it's EZ! Throw it together – no deep thoughts. Altogether 3 steps. 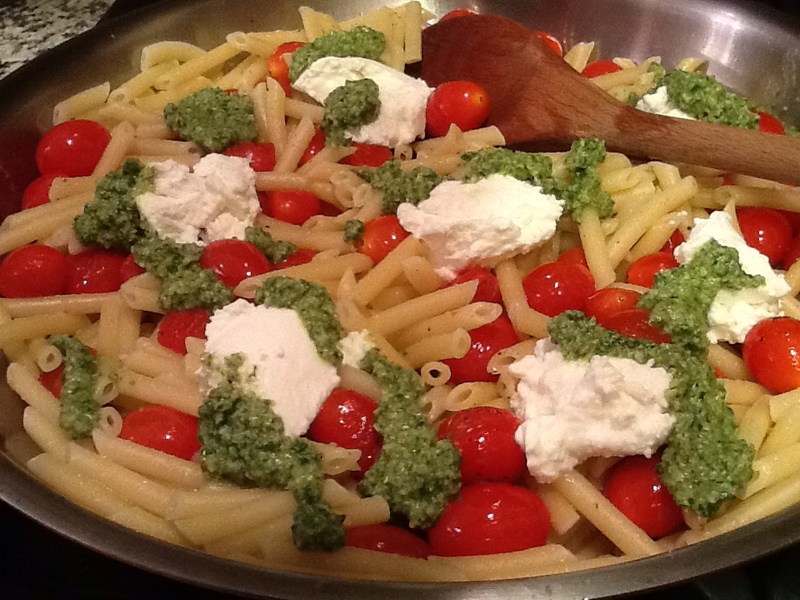 Cook pasta, blend pesto, roast tomatoes. Dot with ricotta and you're wishing for a spork :)! Don't go all crazy with the pesto recipe either – use your hands for measuring and your eyes to judge the texture. Taste to adjust cheese and salt. Blanch a double big handful of basil leaves in hot water, or not. It helps keep their color, but no biggie if u don't do it. Dry. Blend the nuts in the processor. Cook 8 ounces of pasta according to directions. Save 1/2 cup pasta water. Cover bottom of large skillet with olive oil. Roast 2 pints of tomatoes until the skins burst. 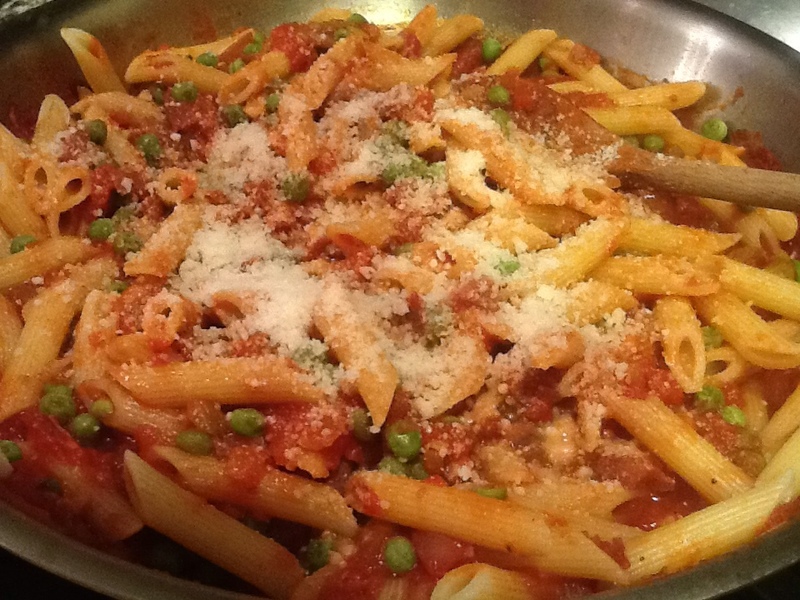 Add pasta to tomatoes, toss and add enough pasta water to clean the pan bottom. Drizzle pesto. Dot with ricotta (1/2 cup or more). Despite the season our local farmer’s market had some hot looking tomatoes last week. They couldn’t be from around here, but family genetics make me desperate. Saturday would be mozzarella, tomato & basil day. Friday would be grilled lamb and pasta with a raw (crudo) tomato sauce. It’s super flex, requires no measuring and except for the tomatoes, just about anything can be deleted or added. Cook pasta according to directions, drain. 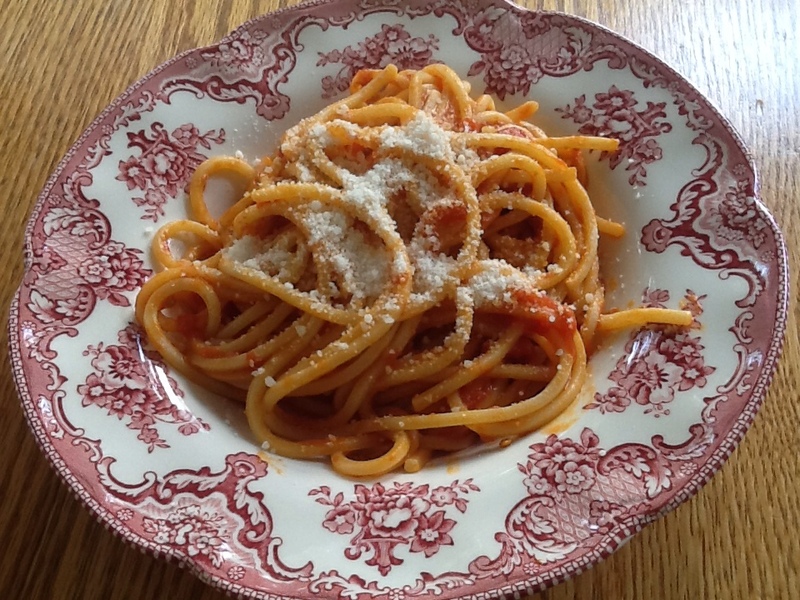 Add tomatoes & basil to bowl, then hot pasta, a drizzle of olive oil, cheese to your liking and adjust seasonings. I make this one pretty often. It’s a big batch veggie stew based on ratatouille, but with even less finesse. Right here is a family dinner and lunches for about a week for my faux vegetarian child. She claimed vegetarian status years ago, but insisted it included every variety of Chinese pork dumplings, hot dogs and her babysitter’s West Indies chicken, peas & rice. Too representative of her personality for the rest of us to let it go, then or now…and she hasn’t said it in about a decade. I like to pop this in the oven so I don’t have to watch the heat, but it works stovetop just fine. I throw beans into the mix to up the protein, but it’s not necessary. Fresh herbs are a great addition. Soft ones like parsley and basil get added at the end. Throw sprigs of woody thyme or oregano right on top, then remove the strands before serving. If I were its only customer, I’m pretty sure pitted olives, green or black, might find their way into the pot. Non vegans will love this with cheese, parmesan, ricotta or bocconcini. In large heavy bottom pan over medium heat add olive oil and onion. Cook for about 5 minutes, then add garlic. Cook 2 minutes, then add all of the other ingredients. Tomato lovers add all of the liquid from the can. If you’re on the fence, add what satisfies your taste, using water if necessary to make up the difference. Bring to a boil, put a lid on it and into the oven. If cooking stovetop, turn down to a simmer. 30 minutes should do it. There is one sure fire way to get people (children, reluctant spouses/partners – present adult company excluded!) to eat their veggies. Garlic! At least that's one secret. The other is pasta. 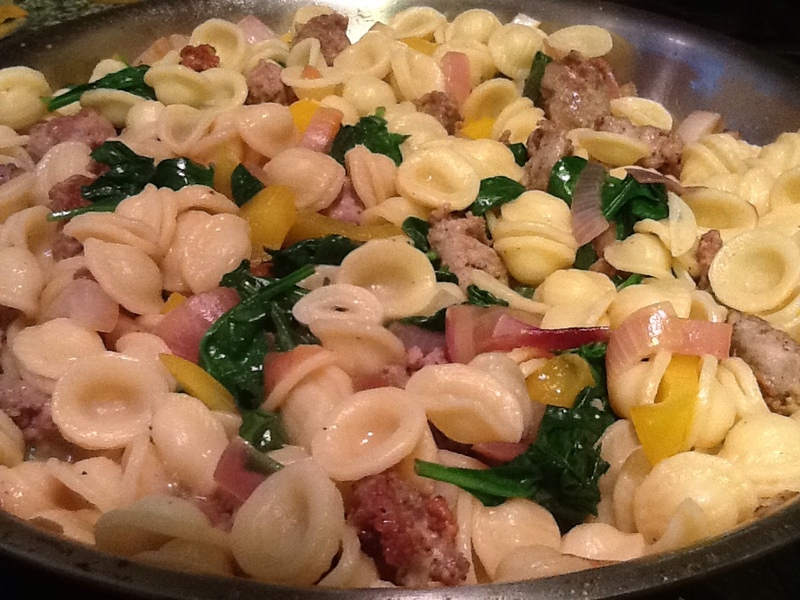 That's why this pasta dish gets the greens gone, especially mild mannered farm friends like spinach. Seriously, if it works on my little/big guy, it will work on anyone. And don't forget the hard sell. Don't just serve, talk it up. Doesn't this smell awesome? 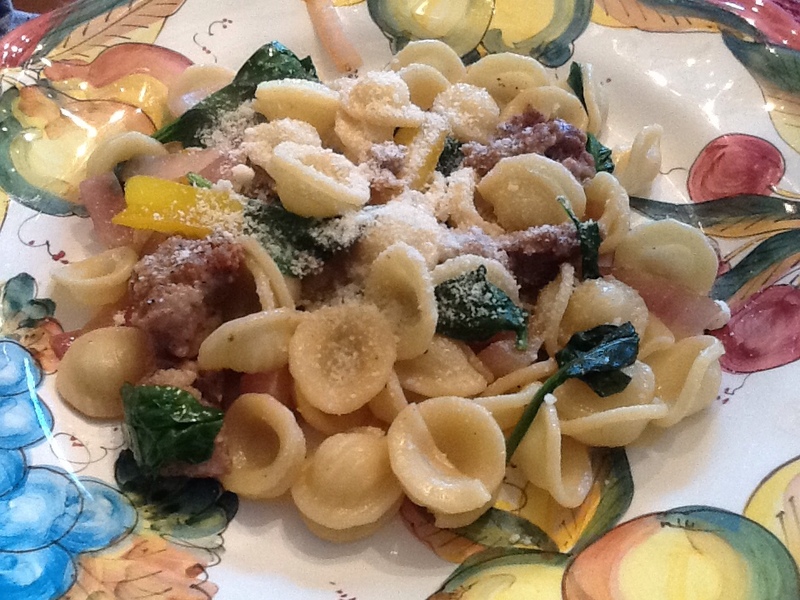 Did you know orecchiette means “little ear”? Italians can make sauce using starchy water…basically say anything except you'd better eat the spinach. I like a one bowl supper too-it saves on dishes. In fact, if push came to shove, this dish could be made with one pot as well. Cook the pasta first, save a cup of the cooking water and then proceed. I used 2 pots as it's modestly faster. Just decide which is more important to you – pot washing or speed? Start pasta water and cook according to directions. Meanwhile add a dollop of olive oil to large skillet. Medium heat. Brown the sausage on all sides and cook through. Remove. Add onions, salt & pepper. Cook 3-5 minutes. Add bell pepper & garlic. Cook 3-5, watching the heat. Pour in wine, raising heat and cook until it's mostly absorbed. Add spinach and drained pasta. Toss to let spinach cook. 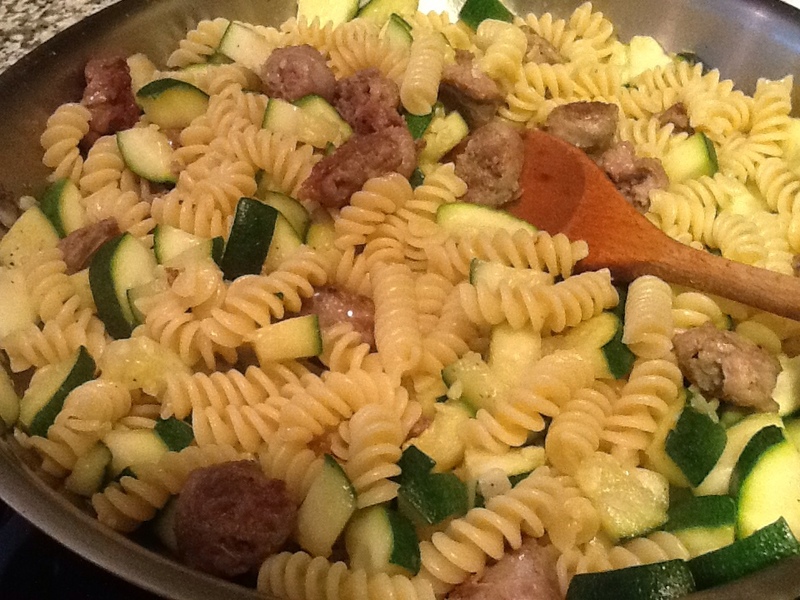 Put sausage back in skillet with enough pasta water to make a sauce. Swirl in butter.